First professions in India | Walk with us! Fr. Tom was among those who took part in this year’s profession ceremony in India. Fr. Tom Cassidy writes about today’s First Professions in India. Congratulations to the Novitiate Class of 2015! This morning the big day for the novitiate class of 2015 finally arrived. 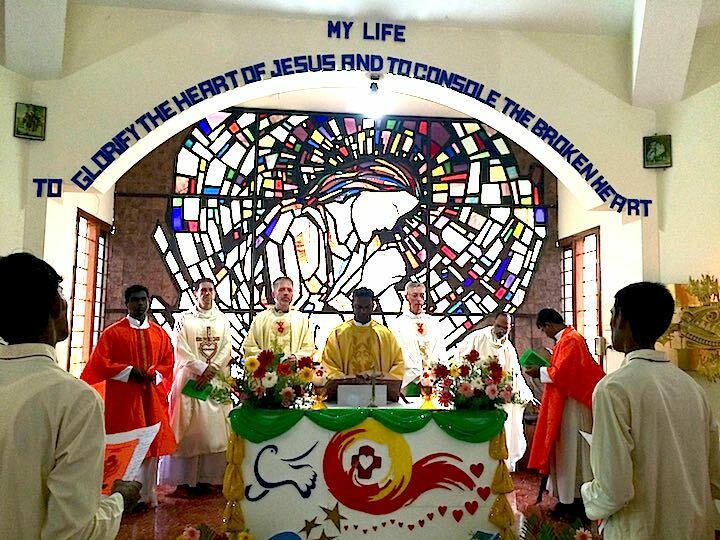 After 13 months as novices they would finally become full-fledged members of the Congregation of the Priests of the Sacred Heart by making of their first profession of vows of poverty, chastity and obedience. Our day began early, especially for those family members who did not arrive last evening and choose to travel to Nambur in the morning. A good example is my own Eluru community who left the house at 4:30 am to arrive in time for the 6:30 am start of Mass. Actually, for those of us living in the house the start of the day wasn’t much different time wise, in fact just a half hour later then the normal start for prayers. This morning we began our day with morning prayer at 6:00 am after which all went about getting ready for Mass. 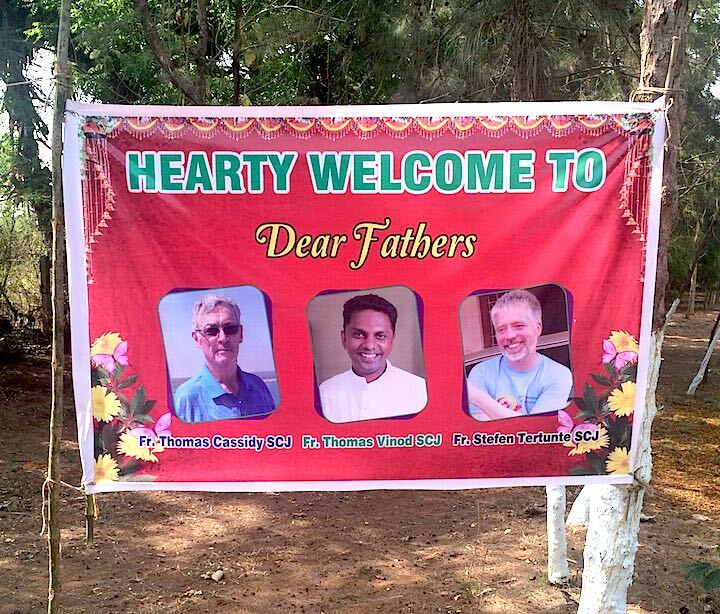 A special banner was made to welcome the VIPs: Fr. Tom Cassidy, Fr. Thomas Vinod (district superior) and Fr. Stefan Tertünte (director of the Dehon Study Center in Rome; he was in India giving formation workshops). For some the arrival of morning didn’t come soon enough. We had power problems in the house, and in this case it was a local house issue so many rooms were without fans (and air conditioners) for parts of the night. Frankly, life is unbearable in the sleeping rooms without some form of ventilation at this time of year! Some opt to sleep outside and enjoy the cooler temperatures but then they must deal with mosquitoes and who knows what other critters of the night. As for the Mass of First Profession, our chapel isn’t all that large so each of the ten novices were limited to about 15 guests. These were added to the many SCJs who came for the celebration along with sisters, novices and priests from the surrounding area. I was able to catch up with some of our Eluru brothers who have been on their vacation/pastoral time. This group returns to the scholasticate on May 10, and the four students now in the house will take their holidays. We were able to start the Mass pretty much on time with Fr. Thomas Vinod, SCJ, district superior, as the main celebrant. Joining him on the altar were three members of his council, Frs. Jojappa, SCJ, Jesu Manuel Baena, SCJ, and Mcqueen, SCJ (novice master) along with Fr. Stefan Tertünte, SCJ and myself. presents Br. 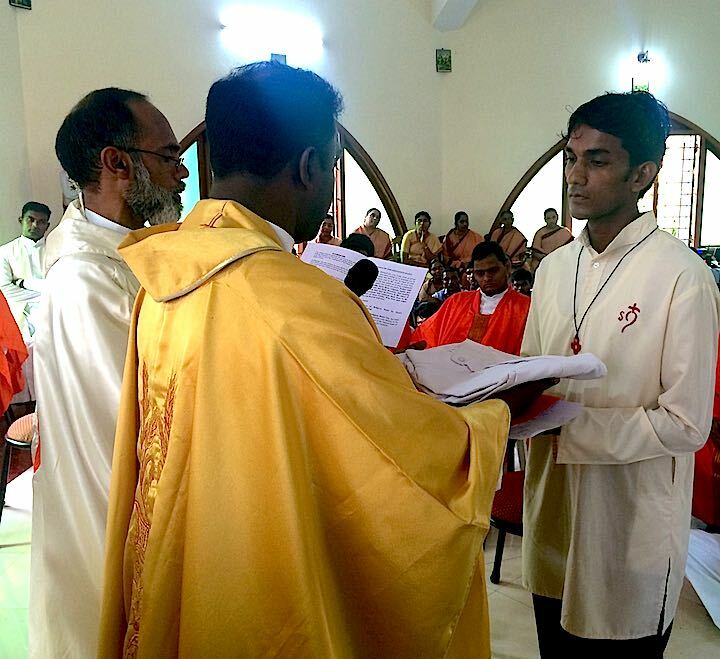 Siddela Jesuprasad (Jesu) with his cassock. Then there was the presentation of the profession cross and cincture (vows cord), and the presentation of the Rule of Life and Divine Office. After communion two of the novices expressed thanks on behalf of the entire profession class to the many people who have influenced their lives and brought them to the altar this day, as well as to all those who helped make today’s celebration such a festive occasion. We ended the Mass around 9:00 am and this was followed by brunch on the basketball court. Of course it began with the obligatory cake cutting to be shared by all. By 11:00 am things began to wind down and families returned to their homes. Most of those who came hail from Andhra Pradesh, in fact four of the newly professed come from the Diocese of Guntur and two from Eluru while for the rest, two are from Kerala, one from Vasai (Mumbai) and one from Odisha. The newly professed plus the six remaining novices and a few of our own brothers from Eluru were quickly put back to work to tear things down and get the house back in order. It’s somewhat of a rush job because tomorrow morning at 6:00 am most of the newly professed will travel with Fr. McQueen to Mumbai for a quick four-day visit to the family of Br. Sajeet, SCJ, as well as to our SCJ Vasai parish.